At the time of the collapse of the Soviet Union Bridget Kendall MBE was the BBC’s foreign correspondent. The first female winner of the James Cameron award for journalism in 1992 for her reports of the remarkable events unfolding in the Soviet Union, she is perfectly qualified to deliver both the wonderful radio series and the accompanying book covering the entire period of the Cold War. Described as ‘A new oral history of life between east and west’ it is a comprehensive study of the period through the accounts of those who lived and breathed the reality of Cold War politik and the global theatre on which it was played out. Beginning in 1944 with the Greek Civil War (1944-1949) she records the memories of those remaining witnesses to life in Greece during the troubles including a failed assassination of Churchill by a nineteen year old Bulgarian girl. The more one reads of the accounts the more one realises the importance of obtaining and recording these testimonies for future generations. All to often the focus is on the purely historical and factual analysis of an event whilst the ‘human factor’ goes largely ignored to the detriment of the research. 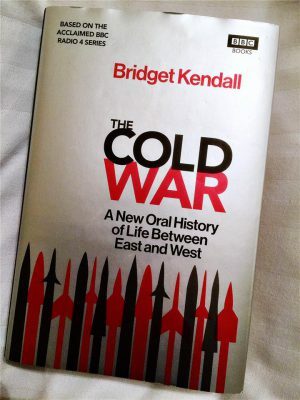 But this is more than just a series of interviews and quotations, Bridget Kendall supplies a supremely detailed and researched narrative to accompany the accounts making this by far one of the best radio documentaries I have heard and a book which now sits at the heart of my collection on the history of the Cold War. All of the key episodes of the period are covered, from the Korean War to McCarthyism, the dropping of the H-Bomb to the Iranian Coup of 1953, the outbreak of the Chinese Cultural Revolution to the Prague Spring and Vietnam. We are reminded of the Angolan Civil War which ran from 1975 to 2002, the Soviet invasion of Afghanistan to Poland’s solidarity movement and of course, the fall of the Berlin Wall. It is impossible to pick any one account out from the rest, they are all fascinating, alarming and often desperately sad. As someone who has a particular interest in the Vietnam War I was, however, drawn to the chapters and radio episodes on the fall of Saigon and particularly the three American veterans whose accounts of American and SVA torture, their disillusionment of the war and their subsequent homecomings should be heard by the widest of audiences. Read the words of Eva Eberbeck and life in the GDR without a telephone or of Annemarie Knecht who tells of the ‘click’ of the Stasi listening devices as they intercepted her phone calls, how they came to recognise their watchers as they tried to live normal, every day lives. It is a reminder of what we take for granted, perhaps you are reading this on your smartphone, free to go wherever you choose, book a flight, eat imported fruits or buy designer clothes. Reading and listening to these accounts from the 1940s through until as recently as the late 1980s places a great deal of modern life in its necessary perspective, we should all take time out to remember and realise.